Thanks for your story! It is remarkable how different pregnancies can be. My post-partum experience was actually fairly similar to yours - the weight slid off and keeps sliding (I think it is the breastfeeding, because I, too, eat like a trucker), but the belly remained (and still does a little at 4 months out). I think we are the lucky ones in regard to the weight sliding off, but I too wonder if I will ever get my pre-pregnancy body, and think that the answer is probably no. For the time being, the opportunity to eat like a trucker is amazing. This was really an interesting post, especially the part about post-partum (you can bet I'm curious about that!). I think the idea of weight gain during pregnancy is a sensitive and interesting topic. When I was in graduate school, one of my professors was doing research with pregnant rats and found that restricting their calories during pregnancy actually led to obese rats later in life. But, that doesn't mean we should just eat and eat either. I think it's about balance and eating healthy. It shouldn't be about how much you gain or don't gain. In fact, at my midwife practice, they don't even weigh you (unless you look really out of the norm one way or the other) and instead focus on nutrition and food diaries. At 40 weeks, I've gained just about 30 lbs, and I'm ok with that. And, as you said, it definitely wasn't a steady, one-lb-a-week, pattern. It was all over the place. The study with the rats makes sense... the reason is that in "calorie-deprived" situations the metabolism changes and adapts to scarcity, in such a way that to explain it simply, whenever there is food available, you store it all, to prevent and prepare for periods of shortage. And even though adipocytes (the cells where we store fat / extra sugars ) do not reproduce in adults, they do in young children and foetus. So, rats exposed in-utero to these conditions would have developed more adipocytes (storage room) and therefore have a tendency to obesity later. But like you say, it's about balance and eating healthy. I think you are right about balance and eating healthy. I feel like I ate fairly healthy in general before pregnancy, and continued eating in a similar manner during pregnancy (except those croissants...), so maybe that had something to do with how my weight gain went. But like I said, I felt like I had very little control over what my body did, other than trying to keep eating healthy. Great post, Anna! 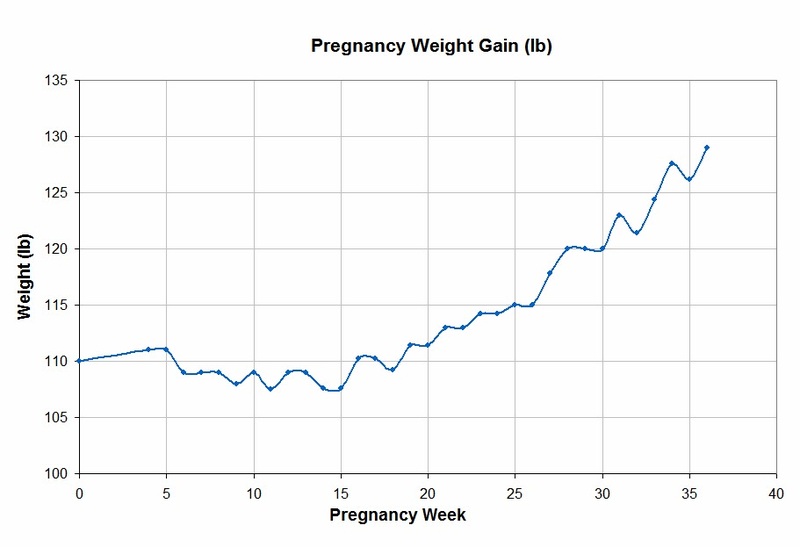 I had a very similar pregnancy weight gain and postpartum experience. I lost about 5 pounds in the first 14 weeks, and then by 39 weeks (when my baby was born), I had gained 24 total (so 19 up from my pre-pregnancy weight). And while pregnant, my thighs and arms actually got smaller. I think my body actually pulled from fat stores I already had!! I ended up with an emergency c-section, and they helped my uterus shrink a little faster than normal, but also pumped me full of fluids (those ankles and feet!) By 2 months postpartum, I had not only lost my 24 pregnancy pounds but also an additional 15 pounds. I too credit breastfeeding for the increased metabolism. And the fact that I gave up dairy (my boy has a milk protein intolerance) probably helped, also. Regardless, my body SHAPE is forever different, and I don't mind one bit. Thanks for sharing! Thank you for sharing your experience, Mary! Breastfeeding really is amazing in terms of upping that metabolism. So sorry that your boy has a milk protein intolerance. And your new shape is great, you look wonderful! Thanks for the honesty here... it is difficult to know what to expect, as like you say every pregnancy is different and we won't all fit in a textbook chart. At 22 weeks I have put on about3.5- 4 kg (approx 8 pounds), but I do read that most of the weight gain happens in the last trimester. I am mostly in awe at what the body is able to do, but changes in shape can be difficult to handle. Better be ready for it (at least a bit) and go with the flow.